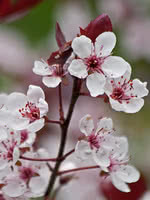 Purple Leaf Sand Cherry provides bright reddish-purple leaves that turn bronze-green in the fall. In the spring, tiny flowers with a pinkish white hue bloom. The flowers are small, but the impact comes from the shrub blossoming all at once. The Purple leaf sand cherry can be susceptible to pests and diseases in more humid areas; a typical life span is approximately 15 years. Not suitable for a privacy hedge on its own but is often alternated with lilacs. Often used as an accent plant that attracts birds and bees.